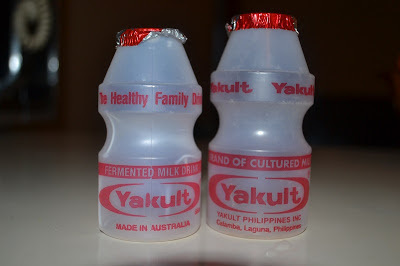 My son loves Yakult and we make sure he has one in his lunch box everyday. But the most baffling thing is the size of the Yakult bottle. If you thought the bottle was small in the Philippines, check out the bottle from here in New Zealand! Photo above for comparison. It does make one wonder about the size discrepancy. Now, why is the bottle so small in the first place? This question came up while we were on holiday in the Philippines a couple of months back, and a friend had a couple of bottles in his fridge. We commented on how the bottle was much bigger than what we have here. Luckily he had the opportunity to visit the Yakult factory recently and he asked the same pressing question. And the answer he got was there was the shelf life to consider. In the Philippines, it does not travel as much because a factory is located in the country. So I assume that Yakult that's manufactured in the country is only for local consumption? In the case of New Zealand, Yakult has to be shipped from Australia, so by the time it hits the shelves, it would have spent part of its good life in transit. Hence the smaller size to control shelf life. Other explanations can be found in the Yakult Malaysia website; it mentions that the small bottle is sufficient for 30 million live bacteria. Furthermore, it is not intended to be a thirst-quenching drink. And finally, a smaller bottle has a better guarantee of its being consumed in one go and is therefore more hygenic. So... mystery solved... I think. PS I just found this Youtube clip of Yakult in Japan.... they have the same size as we do here!